The Philippines raised the alert level for the country's most active volcano twice in 24 hours Sunday, meaning that a hazardous eruption is possible within days. 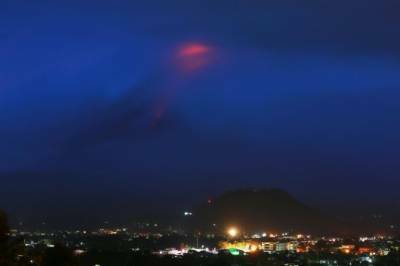 A bright glow from Mayon volcano 's summit crater indicated the start of lava flow, while steam and ash plumes were produced by three steam-driven eruptions, according to the country's volcanology institute. Mayon's status was raised late Sunday to Level Three, meaning "increased tendency towards hazardous eruption". "This means that Mayon is exhibiting relatively high unrest and that magma is at the crater and that hazardous eruption is possible within weeks or even days," the Philippine Institute of Volcanology and Seismology (Phivolcs) said in a statement. More than 900 families have been evacuated and temporarily sheltered at nearby schools, a national disaster agency spokesperson told the Manila Bulletin. A seven-kilometre (four-mile) extended danger zone has been recommended on the volcano's southern flank. The public is urged to be vigilant and avoid entering the area "due to the danger of rockfalls, landslides and sudden explosions or dome collapse that may generate hazardous volcanic flows", Phivolcs said. Civil aviation authorities were told to advise pilots against flying near the summit due to the danger of erupting ash, which can be hazardous to aircraft. The 2,460-metre (8,070-foot) Mayon, located about 330 kilometres southeast of Manila, has a long history of deadly eruptions. Four foreign tourists and their local guide were killed when Mayon erupted in May 2013. In 1814 more than 1,200 people were killed when lava flows buried the town of Cagsawa. An explosion in August 2006 did not cause direct deaths, but four months later a typhoon unleashed an avalanche of volcanic mud from Mayon's slopes that killed 1,000 people. "For the past 24 hours, Mayon Volcano in Albay Province has noticeably increased its unrest," warned Phivolcs.